Miss Pukey Puke Sherilyn puked again this mornng. She got scolded by daddy this morning as she was playing with her water tumbler on our bed and spilt water on our bed. I was busy downstairs on my computer trying to book an Air Asia ticket for my maid to go back to Indonesia. When daddy brought her downstairs, she was still sobbing and refused to let go of daddy. She wanted reassurance, lots of reassurance from daddy that he still loves her. When daddy left the house for the office, she bawled and screamed and cried till she puked – the curdled milk that she had drank minutes ago all splat on the floor and the smell of it that wafted through the house was strong enough to make me nauseous instantly. Alycia and Sherilyn LOVE playing hide-and-seek with daddy. Every night they would wait for daddy to return so that they can play hide-and-seek with him. Daddy would hide behind the curtains, under the comforter, inside the closet and inside the bathroom. As they count 1 through 10, daddy would hurriedly dash from the gals’ room to our room to hide. It’s so nice seeing the girls squeal in excitement and suspense as they search for daddy. This is a picture of daddy playing hide-and-seek with his 2 princesses. I’ve mentioned before that my hubby will do anything or buy anything that his 2 princesses command for. Several days ago as hubby was about to leave the house for his office in the morning, the gals wanted his attention and started to act up. So daddy promised them that he would buy them balloons (the long ones like sausages as the gals specifically ordered). Later in the evening, I thought the gals would forget about daddy’s promise, afterall it was just another empty promise to subdue them but boy was I wrong. The gals kept mentioning about it the whole day. Daddy kept his promise. Not only did he buy sausage-shaped balloons, he also bought a packet of party whistles and a can of party strings/confetti. To me, they are a waste of money but to daddy, it’s his way of showing his love to his 2 princesses. Daddy inflating the balloons with a pump. Daddy even mastered the skill of shaping and twisting the balloons into animals from the clowns at the hotels that we normally patronize. The gals happily blowing the party whistles whilst daddy was trying to amuse them with the can of confetti. For the first time, Sherilyn got whipped from daddy yesterday. It was almost dinner time and daddy came home early yesterday and was lying on the floor in the hall to get some rest. Sherilyn was playing and started to throw her toys everywhere. When daddy scolded her and told her to stop throwing the toys, as usual, she tried to turn deaf and continued with her toys throwing spree until a ‘flying saucer’ which was an Ikea plastic plate landed on daddy’s mouth and cut daddy’s inner lip. He bled quite a bit and was in pain and he was furious. When daddy showed the bloody lip to Sherilyn, she was scared….scared because the usual fun-loving and forgiving daddy looked very furious and in pain. This is how frightened and worried Sherilyn looked. Daddy – Kay Yi, which hand did you use to throw the toy at daddy? Look at daddy’s lip…. it’s bleeding. Daddy got to punish you now. I will beat your hand 3 times. and she retracted her hand. I was controlling hard not to laugh at the silly excuse given by Sherilyn. What kind of excuse is that, saliva on her hand! Daddy – give me your hand Kay Yi…..
but she struggled to stay her hand away from daddy like this…. Finally when daddy wanted to pull her hand out…. I laughed hard but pursed my lips tightly to contain the laughter coz Sherilyn sounded so cute when she blurted out ‘enough daddy’ in her babyish voice. Daddy too wanted to laugh but tried really hard to suppress his laughter. Anyway, daddy gave her another light whip on her hand and then we all proceeded to have dinner. For 15 minutes during dinner, Sher just stared blankly at daddy observing closely his expression and perhaps trying real hard to figure out how to cheer daddy up. She was chewing her food but not swallowing them…. just staring at daddy. Daddy – swallow your food Kay Yi. Sher continued to stare at daddy with a guilt-stricken expression on her face. Daddy’s heart melted. He walked over to Sherilyn and let her kiss him on his cheek. Sherilyn really knows how to melt the coldest of heart and douse off a fire raging an angry heart. She’s really manipulative and witty. Really, you tell me, how to get angry with her leh. Alycia always imagines she is a princess. For the past 1 week, Alycia has been demanding that daddy carries her off her bed in the mornings and then carries her downstairs like a princess. Last night when daddy was tucking her to bed she said “daddy tomorrow you carry me downstairs, k” and this morning, daddy waited for Alycia to wake up before he went to his office, carried her off the bed and gave her a morning peck on her cheeks before carrying her like a princess downstairs for breakfast. 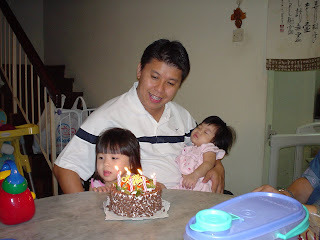 Wah… this daddy is ever ready to accomodate all the “your wishes are my command” from his 2 princesses. I wonder if my wish is his command too…. Before Alycia and Sherilyn came along, daddy would sometimes carry mummy to the bed like a white knight sweeping his princess off her feet. After the both of you came along, daddy complains of backache to mummy all the time but the pain seems to have miraculously vanished when you both asked to be carried. Before Alycia and Sherilyn came along, daddy would caringly wear socks for mummy when she had the sniffles. Now that daddy has you 2 darlings, he would obligingly wear socks for his 2 princesses no matter how busy or tired he may be. As for mummy? She knows how to wear the socks herself mah. Before Alycia and Sherilyn came along, daddy would always lovingly help get mummy some food when they have meals together. Now that he has 2 beautiful princesses, he’d rather be feeding them. Mummy leh? Aiyah… no need to eat so much wan, eat less is good. Before Alycia and Sherilyn came along, Daddy and Mummy enjoy sharing their desserts together and they can peacefully take their own sweet time to savour every spoonful. Eversince you both came along, daddy prefers to share his dessert with his 2 princesses, though most of the time, he ends up having none. Before Alycia and Sherilyn came along, daddy and mummy would always have a beautiful couple snapshot together when it’s our birthdays. Now that you both are here, mummy is always the cameraman and no where to be seen in pictures. So is mummy still happy now that she has you both? The answer is a resounding YES, absolutely no regrets and no, mummy is not jealous. Alycia and Sherilyn, when you both read this post a few years down the road, you will know how much your daddy and mummy love you. This is the new toy that DH secretly bought his 2 angels from Mid Valley Megamall yesterday… a school bus tent. Well, I shall see how long this new toy can sustain the gals’ interest before being chucked into the storeroom if it is lucky enough to remain intact or being ripped apart into pieces. Taking turns to play bus driver and school children. This bus even comes with an inflatable steering wheel that’s attachable to the tent. The driver on the bus goes honk honk honk, all through the hall. Once in a while, daddy will be home early to read bedtime stories to the gals. These are considered rare treats from daddy and the gals enjoy every moment of it. As for me, they are long-awaited breather treats for me…. Daddy teaching the gals how to read the clock.